Before there was MMA, there was NHB, which stands for No Holds Barred. The first UFCs were NHB events and only had a couple of rules--no biting and no eye-gouging. After the first few shows, the promotion began adding more rules, and eventually the sport, which was by this time called MMA, or mixed martial arts, began to get officially sanctioned by state athletic commissions. Nick Lembo, of the NJSACB, was instrumental in bringing the "unified rules" to MMA, and New Jersey was the first state to officially sanction the sport. Now most commissions use these rules when sanctioning MMA events and most states recognize MMA as a legitimate sport. Despite MMA now being a mainstream sport televised on network TV, however, there are still a handful of states that refuse to sanction MMA events. New York is one such state where MMA is illegal. Although you can compete in all the different disciplines of MMA individually, the state still outlaws putting all of them altogether in one fight. The absurdity of this position cannot be overstated. There are many very talented NY fighters who have to travel out of state to compete in sanctioned events. To compete in NY, however, means the fighters would have to go "underground." And that's where the Underground Combat League was born. 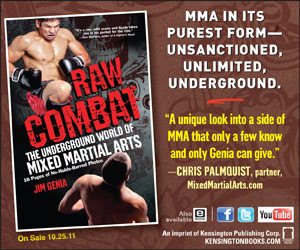 It is also where Jiim Genia's book, called Raw Combat: The Underground World of Mixed Martial Arts, comes in. The UCL said to hell with New York's ban of MMA, and began holding their own events. The UCL's founder, called simply "Peter" in Genia's book, regularly holds (and competes in) MMA events around New York City. These events are technically illegal, and the rules are minimal. Many well known fighters, who now compete and excel in sanctioned bouts, got their starts in the UCL. Jim Genia, a well known MMA journalist in the NY/NJ area, does a great job of documenting the brutal and furtive activities of underground fighting. In Raw Combat, Jim documents the UCL from its beginnings to the present. He has attended many of the events, which are held in secret at various locations around NYC. He profiles many UCL fighters, who compete not for money, but for pride and honor. Jim does a fantastic job of showcasing the true warrior spirit that these underground fighters embody. His book is also a scathing indictment of the absurdity of New York's ban on MMA. I've been invited to several UCL events, but for various reasons have never yet attended one. But that's okay, because this book makes the reader feel like he's right there in the arena with the fighters. This book is a no holds barred look at a no holds barred sport. It is very well written and conveys the power and attraction of combat sports in its purest and rawest form. If you are a fan of MMA, you really need to read this book. It will give you a unique and insightful view into the hidden world of mixed martial arts. In this book, anything goes. Which is why UCL fights can more accurately be described as "Vale Tudo" than MMA. I highly recommend Raw Combat. It's a fantastic read.